Rebecca Hart and Schroeter’s Romani. Photos (C) Lindsay Y. McCall. 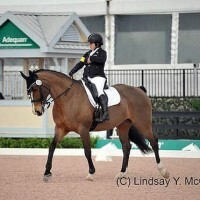 Wellington, FL – January 8, 2016 – United States Para-Dressage riders topped each of the five grades on the first day of the $10,000 CPEDI3* in Wellington, FL. 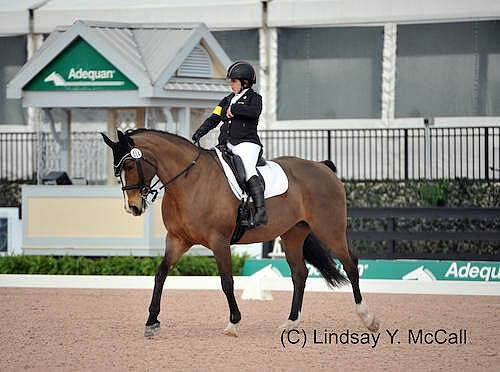 FEI Para-Equestrian Dressage athletes from the United States of America, Canada, and Mexico are competing over the weekend in the 2016 Para-Equestrian Dressage Tour held in The Stadium at the Palm Beach International Equestrian Center, home of the Adequan® Global Dressage Festival (AGDF). 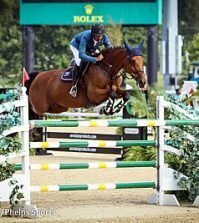 Nineteen horse and rider combinations competed on January 8, in the Team Test competition. Earning the highest score of the day was Grade II Paralympian Rebecca Hart from the United States and Schroeter’s Romani, owned by Rebecca Hart in conjunction with Margaret Duprey, Cherry Knoll Farm, Barbara Summer, and Bill and Sandy Kimmel. Margaret McIntosh (USA) and her own Rio Rio topped Grade Ia, Sydney Collier (USA) and Western Rose, owned by Wes Dunham, earned the blue for Grade Ib, Angela Peavy (USA) and Lancelot Warrior, owned by Rebecca Reno, garnered first place in Grade III, and Mary Jordan and Rubicon 75, owned by Vinceremos Therapeutic Riding Center, took home the rosette in Grade IV. 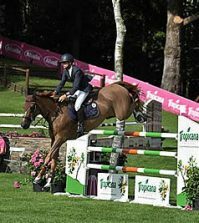 The $10,000 CPEDI3* presented by Mission Control, Mane Stream, courtesy of Rowan O’Riley, Adequan®, and Nutrena, is the first look at each horse and rider combination aiming for the 2016 Paralympics in Rio De Janeiro, Brazil. 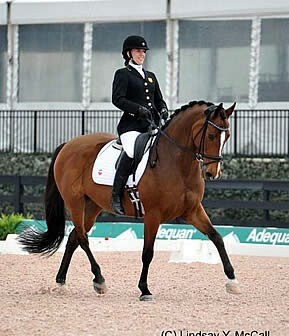 The Para Equestrian Dressage Tour includes the $10,000 CPEDI3* January 8-10, and the $10,000 CPEDI3* January 21-24, 2016. The FEI ground jury for January 8-10 includes President Kristi Wysocki (USA), Carlos Lopes (POR), and Marco Orsini (GER). Following the Team Test competition is the Individual Test on Saturday, January 9, and the Freestyle on Sunday. The riders were tested on Friday not only on their FEI Dressage tests but on how they deal with continually changing weather that included sessions of pouring rain. The riders kept their focus while riding in the beautiful and large Stadium at the PBIEC. The atmosphere resembled many of the World Games’ atmospheres making this CPEDI3* perfect practice for the upcoming 2016 Rio Paralympics. Hart continued, “I want to thank Todd Flettrich, Margaret Duprey of Cherry Knoll Farm, my groom Fernando Ortega, Barbara Summer, and Bill and Sandy Kimmel. Without them I wouldn’t have gone to Europe or competed here in Florida. 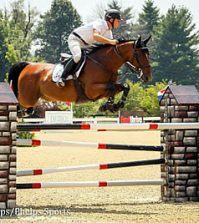 Rounding out the Grades was Grade IV winner and 2010 World Equestrian Games athlete Mary Jordan and Rubicon 75, owned by Vinceremos Therapeutic Riding Center. 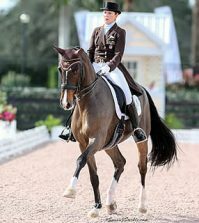 The Para-Dressage Tour $10,000 CPEDI3* scheduled January 7-10, 2016, continues on Saturday with the Individual Test competition in The Stadium at the Palm Beach International Equestrian Center.